RESIDENTS in USJ 23 are angry with the Subang Jaya Municipal Council (MPSJ) for allowing a quarry nearby to operate round-the-clock. Resident Beh Yong Hock said when he first moved in about two years ago, the quarry operated only up to 5pm. The quarry working across the LDP fr USJ 23 and USJ 26. He said it later operated up to 6pm and then went on up to 11pm. "About six months ago, they started operating throughout the day and we have to put up with the constant rumbling sound," he added. He said residents were not even spared during weekends, adding that the only time that the quarry stopped operating was during public holidays. Another resident Robert Chan said the residents had complained to the MPSJ several times but the council had not been able to stop the quarry from operating. Beh fed up with the constant noise he has to put up with everyday due to the quarry nearby. 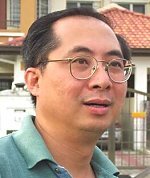 He said when the residents followed up with several more reports, they were informed by the council that the quarry was now operating illegally as the MPSJ had not renewed its permit. He said the residents were puzzled as to how the quarry continued to operate illegally. Chan said the residents were disappointed with the council for not acting against the quarry operator. "During the night, the rumbling sounds of the quarry is really annoying," he added. He said the activities at the quarry was also a source of dust pollution. Chan said the residents also complained to the council that there was no signboard indicating the location USJ 23 and friends or relatives visiting there for the first had difficulty locating the place. "Unlike the rest of Subang Jaya, USJ 23 is located across the LDP nearer to Puchong and people often do not know that USJ extends across the LDP too," he said.